Practical Bible Teaching: CHURCH—Who Needs It? 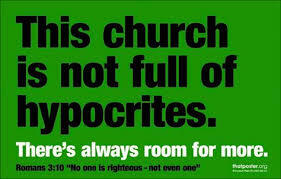 One of the complaints we often hear when asking about church affiliation is, "The church is full of hypocrites." My response has always been, "So?" I need the person to tell me why that is important to them before I try to address their concern. As I see it, their response of "hypocrites" is simply an excuse. Before we get into the meat of this article, take a moment for some light-hearted fun and listen to the following song. I've learned over the years that when a person is looking for an excuse, any excuse will do. Of course, these types of excuses usually belong to those who have no real desire to follow the Lord in the first place. These are they who think that in order to be a Christian you must go to church. Not talking about these. I want to address those who know the value of a good church—the fellowship, community, spiritual growth, commitment, corporate worship, etc. Those who probably at some time in the past have experienced the richness of belonging to a deeply committed and spiritual group of saints; but more recently cannot seem to find that same level of fulfillment. As a result, they find themselves without a church. As I write this, the Body of Christ is experiencing desperate times. There is worldwide persecution of believers—physical, mental, societal, and emotional. Being identified as a Christian is no longer the socially acceptable thing to do. In some countries, it is absolutely a matter of life and death. Being discovered as a follower of the Lord Jesus Christ will cost you your life. There is a falling away from the faith which Jesus and Paul both predicted would occur. [Mat 24:12 KJV] And because iniquity shall abound, the love of many shall wax cold. This "falling away" has been going on for at least as long as I have been around, even though it is now increasing in intensity. Within the church universal we are witnessing all sorts of compromises to the Word of God, which surfaced as the people began to leave their Bibles at home. And, why shouldn't they? There was no real reason to bring them since the Bible is no longer used as the main source of belief and practice. It has basically become a book to which we refer to prove someone is wrong. Or, in the case of a preacher with a sermon, the Bible contains a thought somewhere that will justify the things he/she wants to say. With the ouster of the Bible, our songs no longer carry any theological weight, but simply mirror the expressions and feelings of the world couched in spiritual language. These two things have combined to drive many sincere and devoted believers to abandon church attendance. [Heb 10:25 KJV] Not forsaking the assembling of ourselves together, as the manner of some is; but exhorting one another: and so much the more, as ye see the day approaching. It is a simple, "Don't Quit!" Yes, I understand that there are ways to fulfill this "assembling together" without attending a church. My experience, however, shows that this attempt is usually short-lived. It will not be too long before there is no gathering of any kind. Notice that the reason given for assembling is connected to the "falling away" previously mentioned. Jesus talked about wolves and what they do. His point was that they are dangerous, and we should understand how they operate. One thing they are noted for is their extreme attention paid to "stragglers"—those separated from the group. Those who are not a part of the group, for whatever reason, soon become prey for the wolves. I have been in that place of not wanting to participate in "less-than-the-best." It's hard to find real fellowship with those people. The pastor is too aloof. I felt like I was just 'fresh meat' the first time I went. They believe things I just can't accept. Once I freed myself from the clutches of charismania, I began to see things much more clearly, and began to find God's people in the unlikeliest of places—denominational churches. Here's the real kicker—both those churches belong to what many would consider a liberal denomination. However, as I researched their constitutions, their founding documents, their confessions of faith, the reason for their existence, I discovered that my heart beat in the same rhythm as theirs. So, I went looking for a congregation. Guess what? I found a liberal congregation that I could not be a part of. Guess what else? I found a conservative congregation full of loving and committed people with which it was a joy to be a part. I have been a part of two churches now, whose denomination is liberal but the freedom to be conservative is still a part of their makeup. In both these churches, Jesus is exalted in word and song, the Bible is believed and taught, and the people have a love that just wraps itself around those who come in. I laid down all my expectations except for the necessity of the Word being central to their beliefs. I did not find either of these churches in a large town/city, but rather in a more rural setting. This is not to say that they do not exist in an urban area, but the likelihood of finding one there is slim. If you have found yourself out of fellowship for whatever reason, I encourage you to try again to find a place. They DO exist.